where we share what's going on outside our doors. It's been a while since we've posted a garden update. we hope this visit gives you a taste of spring amid the throes of the winter-like conditions. Each fall we place our pumpkins and jack-o-lanterns in the back bed. This is what happened this year from one of our jacks. All from a few leftover seeds. New lettuce is growing in our big blue container. This is the first time we've grown white eggplant. It'll be interesting to see if there is a flavor difference from the conventional purple variety. and the first of the fruit has shown up. I really need to sow more carrots. as well as on the bamboo tepee out in the back bed. You just can't have enough sugar snaps growing! The garlic that was planted a few weeks back is looking strong and healthy. I had just about given up on this green bean plant. It had suddenly taken a turn for the worse with mottled leaves. I just kept fertilizing it anyway, along with everything else. As you can see, it's now producing just fine, thank you. and a few others in pots. so they will continue to produce. The mums are coming back after being dead-headed. but still working in the garden. Life's pretty doggone good, folks! 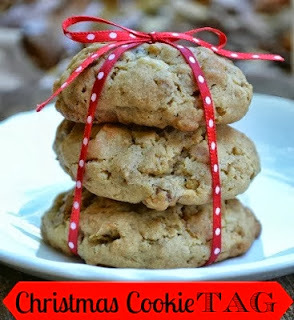 for a yummy recipe in our Christmas Cookie Tag Series! You gardens look so healthy! It seems unusual to me to have gardening photos and Christmas photos in the same post! lol You live in a wonderful part of the world. It's pretty wild, huh? We have enjoyed a couple of mild winters, so we've been able to keep gardening. Gosh, everything is so pretty! It's hard to believe that we have such extreme temperature differences in the US. It is nice to see a bit of green and things growing when everything is just white and icy here! That's why we do the HOP! We love seeing what's going on outside all over. Everything looks so lush and healthy. Your farm school training is really paying off! Where did you get your cotton? I would love to try growing some! I think I got the cotton plant at an Extension Center event. It's native here and I'll bet you have a native variety up there too.